The median pay of chief executives of US corporations listed on the Standard & Poor’s 500 stock index hit $10.5 million in 2013, breaking $10 million for the first time. The figure, based on the findings of a survey published Tuesday by the Associated Press and executive pay research firm Equilar, represents an increase of 8.8 percent over 2012. The Associated Press/Equilar report came the same day the Wall Street Journal released a separate survey targeting a different group of large corporations. The Journal found that median CEO pay was even higher, at $11.4 million. 2013 was the fourth consecutive year that CEO pay increased. Since 2010, executive pay has grown by more than 50 percent. The Associated Press noted that “A chief executive now makes about 257 times the average worker’s salary, up sharply from 181 times” four years ago. These reports are only the latest indicators of the increasingly shameless self-enrichment of the financial elite and the accelerating growth of social inequality. The CEO pay statistics follow the release of a Forbes magazine survey last month showing that the world’ s 1,645 billionaires saw their combined net worth increase by $1 trillion in 2013, to $6.4 trillion. That same month, professors Emmanuel Saez and Gabriel Zucman published figures showing that the share of the national wealth of every segment of the population has declined significantly since the 1980s with the exception of the top 1 percent of income earners, whose wealth has grown dramatically. Larry Ellison, the CEO of software giant Oracle and the fifth richest man in the world, once again topped the Wall Street Journal’s list, taking home $76.9 million in stock option grants for 2013. Ellison’s accumulated wealth stands at an estimated $48.8 billion, more than the gross domestic product of 100 separate countries. Topping the Associated Press/Equilar list was Anthony Petrello, the CEO of oilfield services company Nabors Industries, who made $68.3 million last year. Leslie Moonves, head of broadcaster CBS, got $65.6 million, and Michael Fries, of the television company Liberty Global, made $45.5 million. Three other media executives were on the Wall Street Journal’s top ten: Philippe Dauman of Viacom, who made $36.8 million; Robert Iger of Walt Disney, who made $33.4 million; and Jeffrey Bewkes of Time Warner, who made $32.4 million. The enormous payouts for the CEOs of media companies help explain the role of the US media as a de facto propaganda arm of the capitalist state. The biggest increases went to the heads of financial companies. 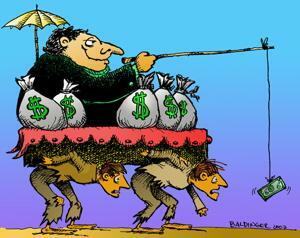 Median pay for Wall Street CEOs grew by 22 percent in 2013, on top of a 22 percent increase in 2012. Larry Fink of BlackRock made $22.9 million last year, while Kenneth Chenault of American Express made $21.7 million. The largest individual percentage pay increase went to Rodney Sacks, the CEO of Monster Beverage, who saw his pay increase 679 percent, to $6.22 million, after the company awarded him an additional $5.3 million in stock options. The payouts were further inflated by the booming stock market. The S&P 500 index rose by nearly a third last year, while the world index of global stocks is near its highest level ever. As a result, the stock portion of executives’ pay packages increased by 17 percent to an average of $4.5 million. This was the real content of the campaign—promoted by the Obama administration—to encourage companies to tie executive pay more directly to “performance,” i.e., share values. Chipotle Mexican Grill, the restaurant chain, spent $49.5 million last year on executive pay for its two CEOs, Steve Ells (who got $25.1 million) and Montgomery Moran (who got $24.3 million). They each received a 27 percent pay raise over 2012. While a typical Chipotle employee receives less than $9 per hour, Ellis and Moran each received about $11,000 per hour, assuming they worked a normal schedule, or 1,000 times more than a typical employee. According to the Labor Department, average weekly wages for US workers increased 1.3 percent in 2013. Even this miserable increase was more than negated by the rise in prices, which increased by 1.6 percent that year. CEO pay, meanwhile, grew by more than 7 percent even after accounting for inflation. While the pay of top corporate executives reaches ever more obscene levels, the earnings of the vast majority of Americans stagnate or decline. Over the past decade, pay for college graduates has risen by just 1 percent, while the average wage of non-college graduates has fallen by 5 percent to $16.50. The growth of social inequality has been deliberately accelerated by the policies of the Obama administration, which are designed to enrich the financial oligarchy by slashing social programs and workers’ wages while pumping trillions of dollars into the financial system via the Federal Reserve Board. Over the past year, the White House and Congress have cut food stamp benefits twice, ended federal jobless benefits for more than three million long-term unemployed, implemented sharp cuts to social spending, and used the rollout of the Affordable Care Act to encourage companies to slash employee health care benefits. The political and media establishment react to report after report documenting an unprecedented concentration of wealth and income at the very top without batting an eye. Yet the prospect of minimally increasing the wage of workers who are living in dire poverty provokes massive opposition within the ruling class, while being portrayed as a radical social reform by its proponents. Obama and the Democrats are promoting—mainly for electoral reasons—an increase in the federal minimal wage to $10.10. This paltry increase, even in the unlikely event of its being passed by Congress, would leave the minimum wage at a lower level, in real terms, than it was in 1968, and would leave a family of four below the official poverty level. If the minimum wage were increased to this level, the typical CEO of a major corporation would make nearly five hundred times the yearly income of such a worker.